The project’s grievance redress mechanism handled more than 900 complaints from affected persons on resettlement- and construction-related issues. Photo: Pierre Arnoux/ADB. The Central Mekong Delta Region Connectivity Project, spanning Dong Thap province and Can Tho City in Viet Nam, is noteworthy for its size and impact. The construction of two large, cable-stayed bridges and a 26-kilometer interconnecting road will cut travel times, improve surface connectivity substantially, and boost the movement of goods and services in an economically vital yet environmentally sensitive part of the country. It will improve connectivity in the Mekong Delta Region and provide efficient access from Ho Chi Minh City to the Southern Coastal Region. With a total loan amount of $410 million financed by the Asian Development Bank (ADB) and $260 million from the Export-Import Bank of Korea, and a grant amount of $134 million from Australia’s Department of Foreign Affairs and Trade (DFAT), the project began in 2013 and is due to be completed in 2018. The project has led to the acquisition of a large amount of land with direct and indirect impacts on people’s lives and livelihoods. The project staff from ADB and DFAT, along with project authorities at the national and provincial levels, met the challenge by designing a comprehensive project grievance redress mechanism and ensuring its effective functioning through multiple enablers. A grievance redress mechanism is a combination of institutions, instruments, methods, and processes by which resolution of a grievance is sought and provided. This case study is adapted from Building Bridges: Lessons from Problem-Solving in Viet Nam, published by ADB’s Office of the Special Project Facilitator and Viet Nam Resident Mission. The study methodology combined data gathered through interviews and focus group discussions with a comprehensive document review. This case study was first published by Development Asia. The project led to the acquisition of 224 hectares of land, having a direct impact on more than 1,770 households with an additional, indirect impact on another 516 households. Based on ADB’s Safeguard Policy Statement (2009), the project is a Category A for both involuntary resettlement and environmental safeguards. During implementation, the project’s grievance redress mechanism recorded and handled a total of 968 complaints from affected people, split almost equally between resettlement- and construction-related issues. It was found that consultations during project preparation and implementation were widespread, covering almost all affected households. Complaints arose during project implementation, relating to either property or assets acquired by the project, i.e., resettlement-related complaints, or damage to property or the environment due to the project’s construction activities, i.e., construction-related complaints. The two kinds of complaints were mirrored by the presence of two separate grievance redress mechanisms, which converged over the duration of the project, as the nature of the problems overlapped. 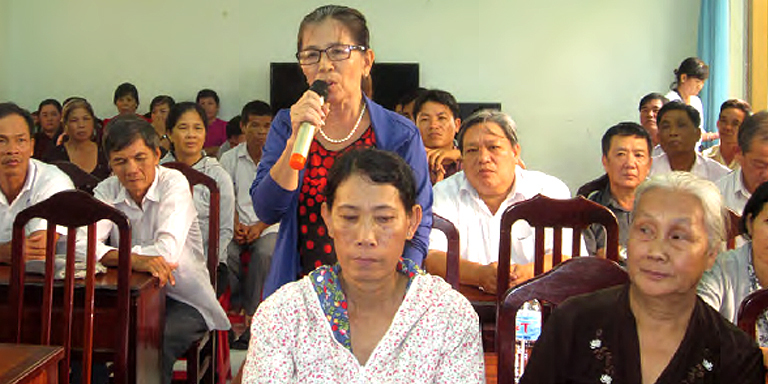 Institutions of this composite grievance redress mechanism include provincial-level land acquisition and resettlement agencies in both Dong Thap Province and Can Tho City. Both agencies organized the resettlement grievance redress mechanisms slightly differently from each other, with the one in Dong Thap choosing to establish a provincial-level Special Task Force that drew on its members’ technical and professional expertise to deal with the large volume of complaints. Meanwhile, the agency in Can Tho set up a Field Office to implement its income restoration program, which then started functioning as a liaison office for problem-solving between affected households and the agency itself. For construction-related complaints, the first point of contact was invariably the contractors, with or without the involvement of local authorities like the commune or ward people’s committees. For both types of complaints, the implementing agency, Cuu Long Corporation for Investment, Development, and Project Management of Infrastructure, played a key role in facilitating, coordinating, and monitoring the problem-solving process, with the active support of the detailed design and implementation support consultant. Project officers of the resident mission and DFAT, as representatives of funding agencies, helped design the grievance redress mechanism through consultations with provincial authorities and amended it as implementation progressed. They also closely supervised the process through both missions and monitoring reports filed with them by the implementing agency and the detailed design and implementation support consultant. Finally, a national Project Coordination Committee with high-level representation from the executing agency, the Ministry of Transport; the implementing agency; relevant central government ministries and agencies; the DongThap Province and Can Tho City people’s committees; and the three funding agencies constituted an overarching supervisory body that provided overall direction to the implementing agency and provincial authorities. Intangible, positive values that supported the relatively unproblematic operation of grievance redress procedures. training or capacity building in problem-solving for members of the project implementation team, including staff of relevant government agencies, the consultants, and contractors. In conclusion, the study reiterates that problem-solving agencies take a holistic view that allows them to handle both resettlement- and construction-related complaints, which may sometimes overlap. In the context of its grievance redress mechanism, the Central Mekong Delta Region Connectivity Project used a range of tools, institutions, and approaches to mitigate possible concerns before they became problems and also resolve any problems that did arise. Planners and implementers of any future project may assess which of these elements are relevant in their project’s context and ensure their integration into its grievance redress mechanism for its long-term sustainability. Sushma Kotagiri works across Asia and the Pacific on dispute resolution and negotiates solutions in complex environments to help project beneficiaries and maintain project outcomes. Antoine Morel is a senior environment specialist at ADB’s Southeast Asia Department (SERD), coordinating safeguards and gender aspects of ADB’s program in Viet Nam.